When you climb aboard one of those Chinatown buses to head from one city’s neighborhood of that same name to the another and feel like maybe your life is in the balance? You aren’t alone. Massachusetts officials found a whole slew of safety problems with the Fung Wah bus line during recent inspections, prompting the company to pull almost every single one of its buses from the road. The state’s Department of Public Utilities found a bunch of cracks in the frames of many of those old buses and as such, is asking the Federal Motor Carrier Safety Administration to shut down Fung Wah until those issues are addressed, reports the Boston Globe. “We’re recommending that they deem this to be an imminent hazard, which would mean that they would shut down the company until the problems were addressed to the satisfaction of the federal Department of Transportation,” Ann Berwick, chairwoman of the state Department of Public Utilities, said in an interview. Cracks in a bus are one thing when buses are older, but the DPU found 21 of Fung Wah’s 28 buses should probably not be on the road, as they could cause the driver to lose control of steering. The company voluntarily removed the buses from service on Saturday night, and is sending the buses to its distributor for further evaluation. The Boston-based company is still running right now but with reduced service between that city and New York, with the aid of charter buses.It’s not commenting, and neither is the Department of Transportation yet, although that agency did confirm it’d received a letter. 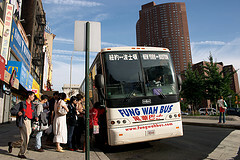 Fun Wah helped kick off the era of low-cost bus services, which often run between different cities’ Chinatown neighborhoods. Those cheap bus services have often been the focus of safety investigations after multiple incidents, including a shutdown of many routes between New York and Florida back in May 2012. Cracks in frames are not uncommon for older buses, the distributor told the DPU, but it is uncommon for one fleet to have so many older buses. These types of cracks can create major safety issues, Berwick said, including causing the driver to lose control of the steering. “Not trivial stuff,” she said.